This is the second collection of Margaret Rizza’s music on Convivium Records, produced in collaboration with the Royal Schools of Church Music (RSCM); see my review of the first volume, Officium Divinum. 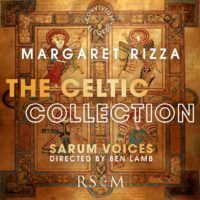 On this new disc we have The Celtic Collection performed by Sarum Voices, conductor Ben Lamb, with an instrumental ensemble. As with the music on her previous disc, Margaret Rizza’s pieces on this disc are gebrauchsmusik, designed to be useful. They are intended to be used as worship songs in services, some are simple enough to be sung congregationally whilst others suit a church choir, and many evoke modern chant. But they can also be used for aids to devotion, and people use the CDs in this way. The music for the pieces on the disc is available direct from the RSCM. For this collection, Rizza has drawn her texts from the Celtic Christianity revival with prayers by David Adam and from Alexander Carmichael’s book Carmina Gadelica. This Celtic theme brings an attractive focus to the music, and a source of slightly different devotional thought to the standard Common Worship and Book of Common Prayer. Rizza has written the pieces with a variety of different instrumental accompaniment, using flutes (Mary Chelu and Tim Ruffer), violin (Daphne Moody), cello (Matthew Forbes), Oboe (Rosalie Watson), trumpet (Martin Ings), clarinet (Jennifer Tilley) and organ (Cathy Lamb). This provides for an attractive variety of timbres in the pieces, and gives an idea for what might be achieved in live performance. Some are four-part unaccompanied, other are more chant-based with Taize making a strong appearance. All the pieces are available as printed music from the Royal School of Church Music. What lifts the disc out of pure practicality is that Rizza’s music has a pleasing melodic facility which makes for attractive listening. And the anthems on the disc receive fine performances from the young singers of Sarum Voices, conductor Ben Lamb, sympathetically complemented by the instrumental ensemble. Planet Hugill is written by Robert Hugill, singer, composer, journalist, lover of opera and all things Handel. Planet Hugill contains regular reviews of concerts, CD’s and operas by Robert, our contributor Ruth Hansford and guest posters, along with concert previews, classical music news, interviews and feature articles on subjects as diverse as Handel opera, Bizet’s Carmen and English opera in the 1950’s. Planet Hugill has been running in its present form since 2011, and averages over 60 postings per month. There is a regular interview slot on Saturday mornings, and recent interviewees have included the composer Sven Helbig, Thomas Lauderdale of the band Pink Martini, the conductor Kristjan Järvi, composer Samuel Bordoli and soprano Rhian Lois. The blog covers the diversity of music in and around London, with occasional forays further afield. We cover performances at many of the summer festivals including Garsington, Glyndebourne, Grange Park Opera and Opera Holland Park, as well as visiting Opera North and Welsh National Opera. Convivium Records is a private recording, production, and distribution label, based in London, UK, provides cost conscious opportunities for composers, performers, educators and students to release and market their music on disc and online globally to professional studio standard. With a range of label artists from contemporary British composers to cathedral choirs, performers and vocal ensembles, the label offers expertise across all aspects of private and commercial productions, with a team of engineers, performers, directors, producers and designers supporting projects from concept to album delivery and marketing.